Beautifully crafted structural wood is unequaled in its ability to create a distinctive interior atmosphere. Architectural wood designs that are customized to blend naturally with other room accents are the specialty of Platinum Home Renovations. We take the time to listen to our customers’ ideas in order to fabricate a truly marvelous integration of wood into the overall room appearance. 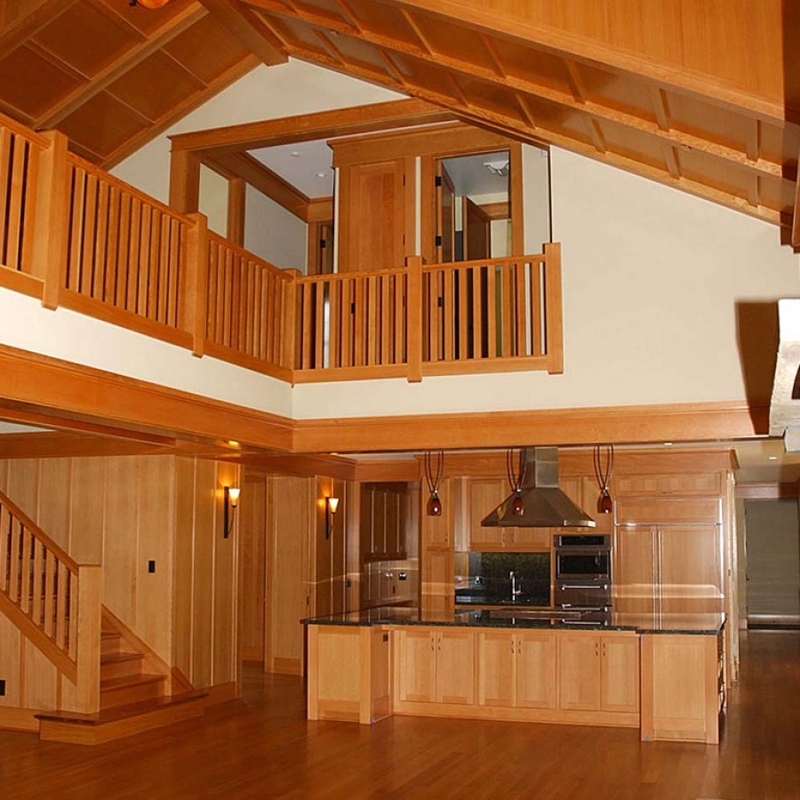 Carefully designed woodwork patterns are more than just a nice complementing of shapes, angles, and tones. The room built around the framework of beams and paneling seems natural only if the variety of materials look as though they were meant to be used in this manner. That’s why unique designs that perfectly fit a particular room are the key to creating the perfect living, dining, or bedroom interior. This architectural design type lends an atmosphere of structural strength as well as beauty. Squared beam patterns that support the ceiling are very popular because they create a primary accent tone along with an angled look that blends naturally with the cabinetry and paneling. Coffered ceiling beams look their best when stained much darker than the adjacent material. Choosing the right wood species is also important because the grain patterns are quite visible. A carefully designed beam support system of this type will also contain hollow sections that are used for electrical wiring used to power overhead lights. Simple hardwood or softwood panels look beautiful, but the uniqueness of a blended look between side beams, panels, and cabinetry is what truly makes a living room stand out. This total look concept is what architectural wood design is all about. Complementary shades of stained or varnished wood highlights the individual features and creates a one-of-a-kind look. There is a distinctive difference between a simple cabinet installation and a paneled room that gives the impression that the beams, panels, and built-ins seem to be growing right out of the walls. This is the look homeowners truly want, and this is where Platinum Home Renovations can help. Everything manufactured and installed by Platinum Home Renovations has been carefully designed with a particular room in mind. We take the time to inspect every aspect of the room including ceiling height, background tones, and line-of-vision. We then create a ceiling pattern, support beam perimeter, or built-in cabinet or chest that blends perfectly with the other room features. Architectural wood design is therefore its own distinct art form, involving clear communication of ideas between contractor and client. At Platinum Home Renovations, our goal is to create an interior that exactly matches what the customer has in mind. Let us create the perfect living room, dining area, or bedroom framed in high-quality, long-lasting wood. Our team of design experts will sit down with you and discuss how your idea can be turned into the most unique, customized interior finish in the entire neighborhood.